People decorated, decorate and will always adorn themselves. Even historical (archaeological) excavations show that in the most distant times people lacked of the desire and effort to create and wear jewelry. And in the vast majority of cultures, jewelry worn by people were not just something nice. The desire of people to create a system of symbols, signs was very high. It’s all helped to distinguish between tribal affiliation, religious customs, marital status, cultural practices of each other. 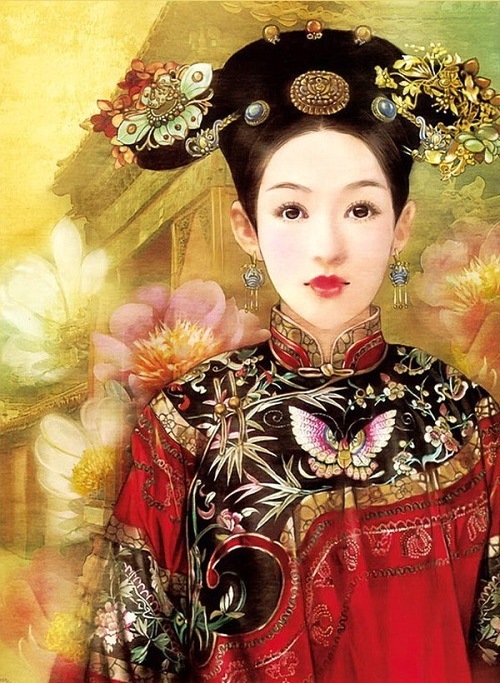 Chinese culture – one of the oldest cultures, which managed to preserve its history. At all times, these people considered hair care, their symbolic value to be very important. The way they trimmed and combed hair demonstrated the civil or social status, religion or profession. Negligence, untidy hair was considered a sign of illness or depression. 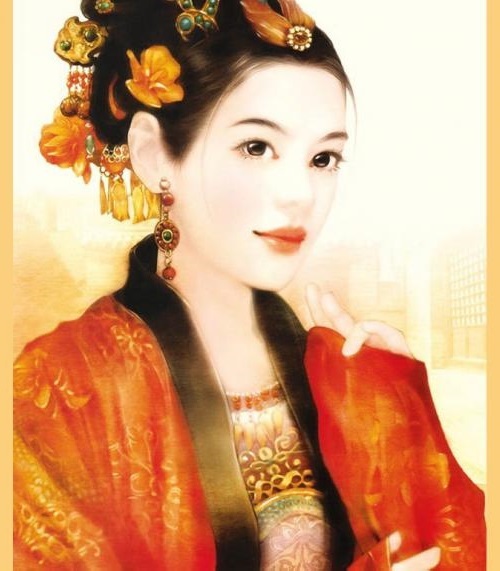 The classic image of Chinese beauty – fragile creature, long thin fingers and soft palms, delicate skin and a pale face with a high forehead, small ears, thin eyebrows and a little round mouth. 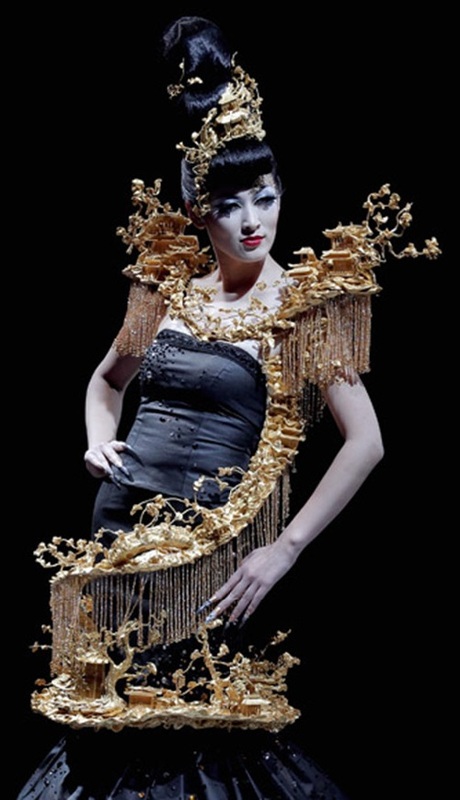 Hair, with the use of studs and pins fixed it into the complex wavy hairstyle that likened the noble flowers or – the highest compliment “the dragon frolicking in the clouds.” The top of hairdressing art was considered the ability to combine the elements in the hair so that the presence of “the dragon,” hidden “clouds” could be just guessed. 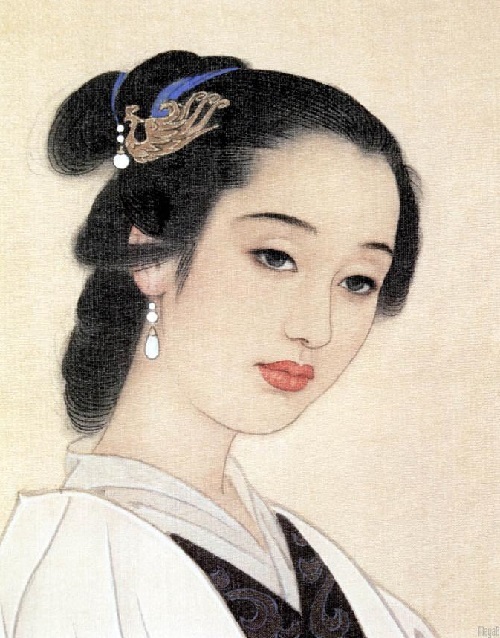 To look elegant, high society women covered face with rice powder and Shaki – rouge, lipstick painted color of “ripe cherries.” The ladies from good families had their hair on the forehead shaved, to lengthen the shape of the face, and to reach the poloidal outline of the lips, applied circle with a lipstick. 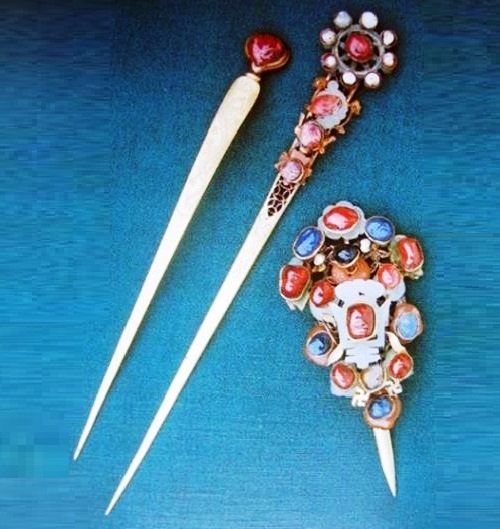 An important role in the complex formal wear until the end of the Ming dynasty played unidentate studs (chi or Zan), the most interesting of which are the bone and jade hairpin of Shan Yin era, discovered in the ruins of the capital Yinxu (now the city of Anyang in Henan Province). Interestingly, the value of materials and symbols in China was different from that in Europe. Developed in the West the classification of materials with the division of stones into three categories: jewelry, gemstones and ornamental stones has not worked and will not work in China. In China all the stones of mineral and organic origin were considered worthy to be used as a decoration or a talisman. In addition, they processed materials such as horn, bone, tortoise shell, enamel, glass, wood (for example, sandalwood). Platinum is almost not applied, the Chinese love gold (Jin) and silver (yin). 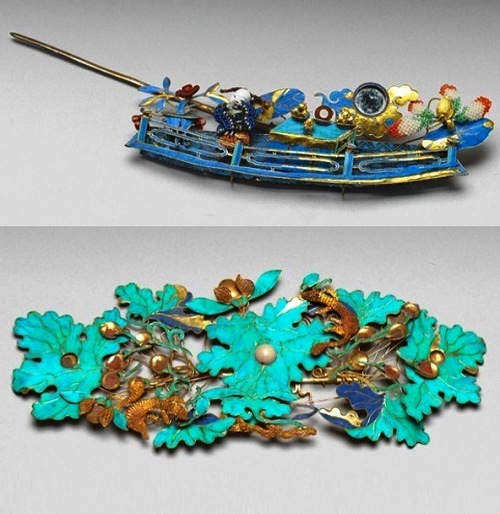 Favorite materials were considered jade (yu), feathers of female kingfisher (Cui Lin), pearl (chu), and coral (shan-hu). 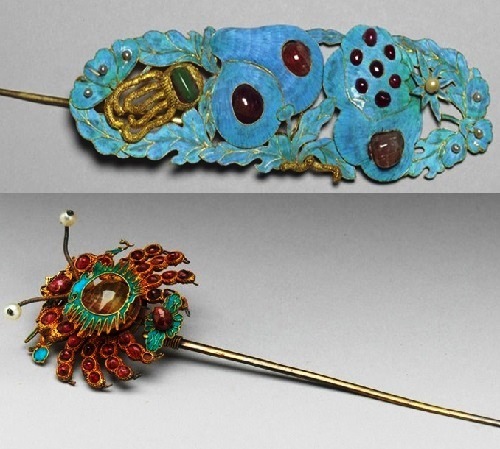 Since the Shang-Yin (XVII-XI centuries BC) to the Han era (III century BC) bronze prevailed, however, gold earrings (er Juan) as rings, and a single-toothed hair pins and studs (Chi) made in the technique of casting, have been found in tombs near Beijing. 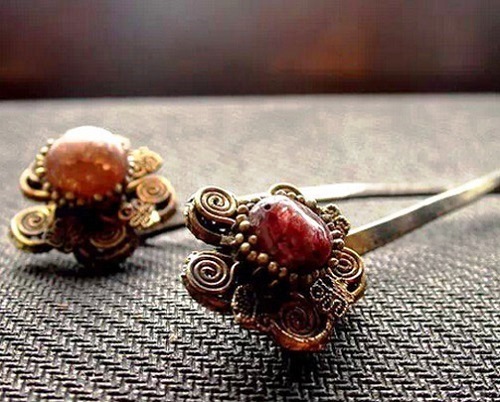 In traditional jewellery were used stones and organic materials, that had ancient symbolism. 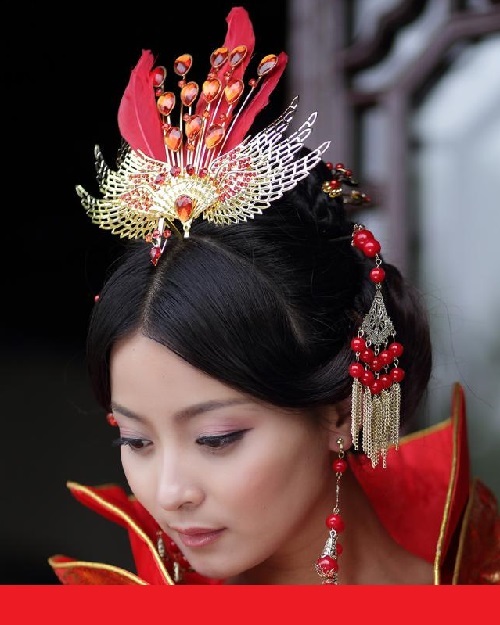 For example, the custom of using bird feathers belongs to Taoism, which came from shamanism. Pearl has been associated with Buddhism, which was associated with a symbolic jewel (mani) means of the Buddha and his teachings. 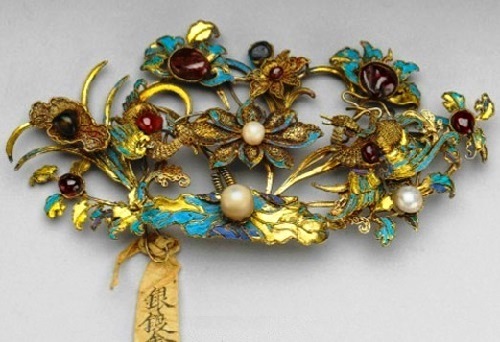 During the Qing Dynasty large marine pearls (Dong-chu) used for the decorations of Emperor and most noble aristocracy. Ninth grade – carved silver. 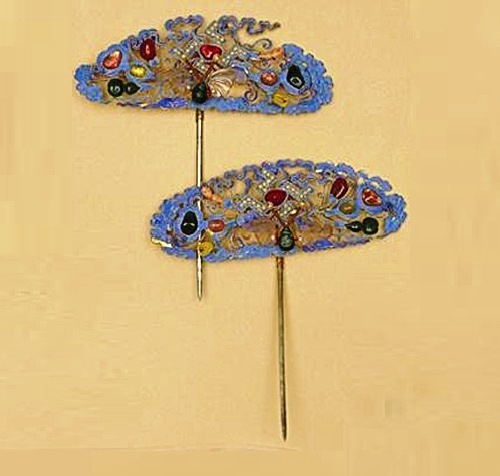 Ceremonial decorations of empresses and noble ladies in the era of the Han was considered large hairpin “bu yao” (which means “shaking while walking”) with pendants swaying in motion, and a diadem shan-ti. 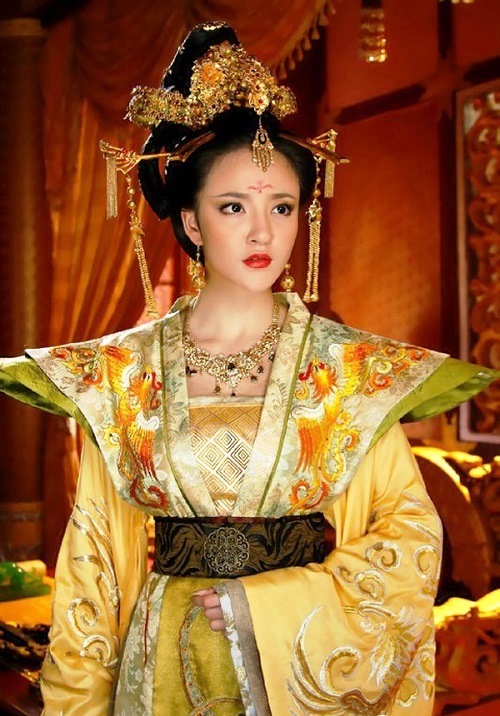 From Tang period until the end of the Ming Dynasty used Crown feng guan (phoenix hat). During the reign of the Manchu, rank decorations of Emperor and aristocrats were gold dragons (Jin-lun), and marks of distinction of empresses and concubines – Golden Phoenix (Feng Jing). 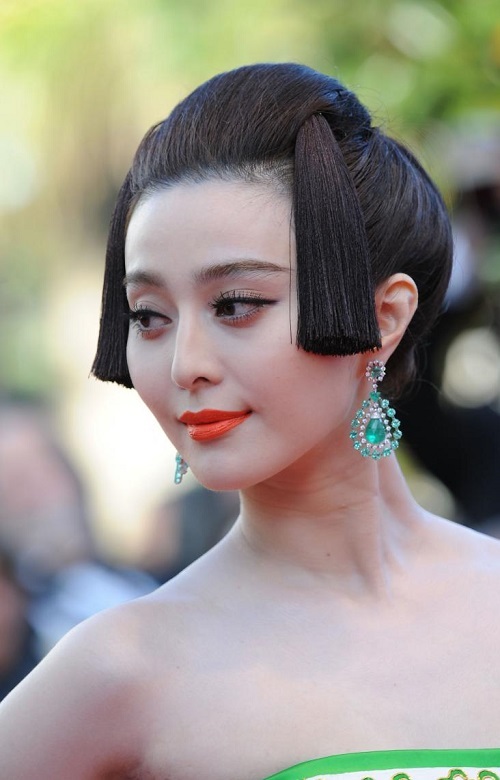 What way passed the hairstyle of a Chinese woman, starting from a young age? 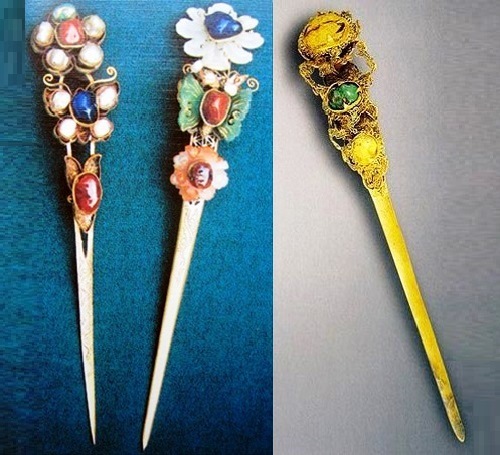 Writer of Ming era Feng Menluna writes about hair pins: “In the past families had their own rules with respect to girls. 13 year-old was thought – too early to “try Flower” (sexuality). Aged 14 years, the “flower has bloomed” (ie the start of menstrual cycle) … And for 15 year-old the flower should be already picked”. 14 year-old girl was allowed to have a special hairstyle and observe a special rite tszitszi or shunun. It marked the attainment of the age when is possible to stick a pin into the hair of a girl. 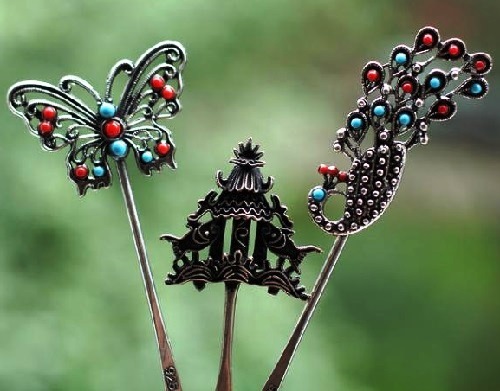 That is, in a feudal society hairpin symbolized not just a woman, but the woman who reached maturity. Just after the girl made a special haircut, usually began to talk about the marriage, and to the girl, or rather, to her parents were sent matchmakers. 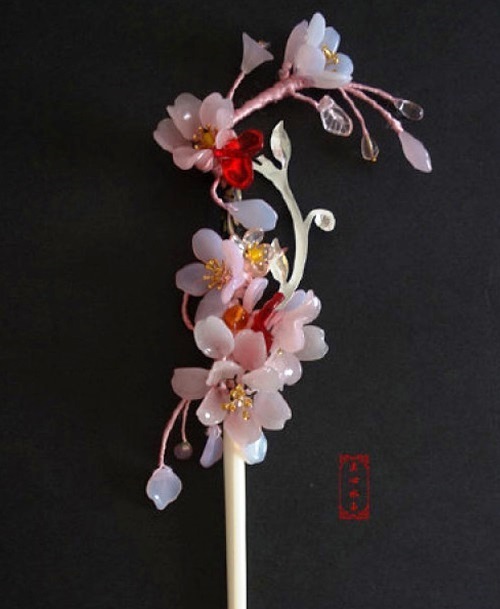 If the bride was ready, the rite of adulthood smoothly flows into the wedding ceremony, and the pin was given to the girl as a gift for the engagement. What could hairstyle say about marital status of women? Single women braided their hair in a plait, while married women collected them in a bundle on her head. At the same time, the widow, who did not want to marry again, shaved her head as a sign of indifference. According to the teachings of Confucius, shaving the hair is to erase the personality. Tuft of hair might look different, depending on the era. Sometimes tuft of hair was above the ears, the hair on the nape was left free, sometimes used special hinges and rollers. Special hairstyle had the bride. Before the wedding, the bride’s hair twisted into a rope or braided in a tight braid, strengthening with 22 long pins crosswise. To decorate the hair used colorful silk cords, strings of pearls, garlands of small flowers. 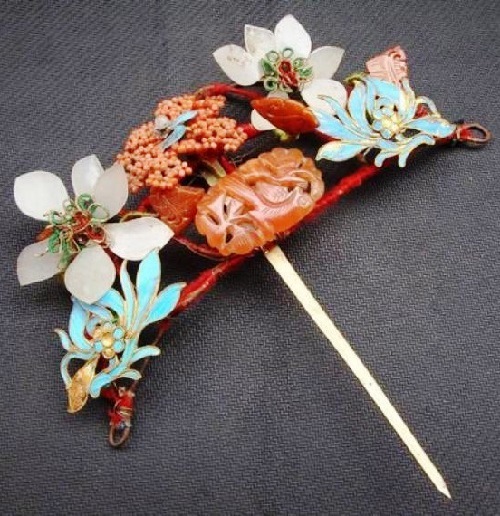 The design of the head ornaments of Chinese women was affected by the religious views of the people. 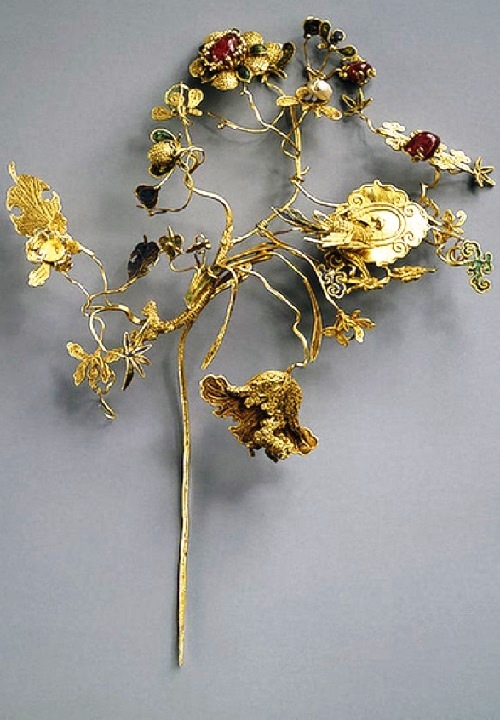 Among the bridal head ornaments found pins and hairpins decorated with symbols-the wishes of male offspring. 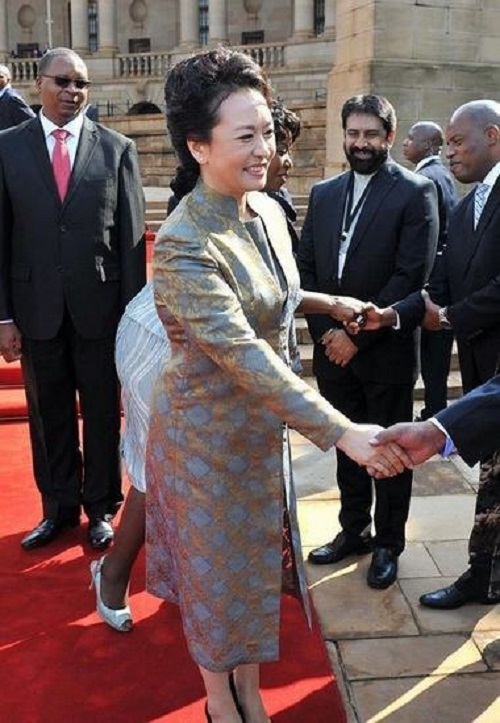 This particular Chinese fetishism of male offspring is a reflection of the cult of ancestors, because only men are empowered to make sacrifices to ancestors. However, there was a more real reason – the fear of losing heir of accumulated wealth. One of the symbols of male offspring is the image of pomegranate (many grains – many children, sons, for grains and children is used one hieroglyph Tzu). 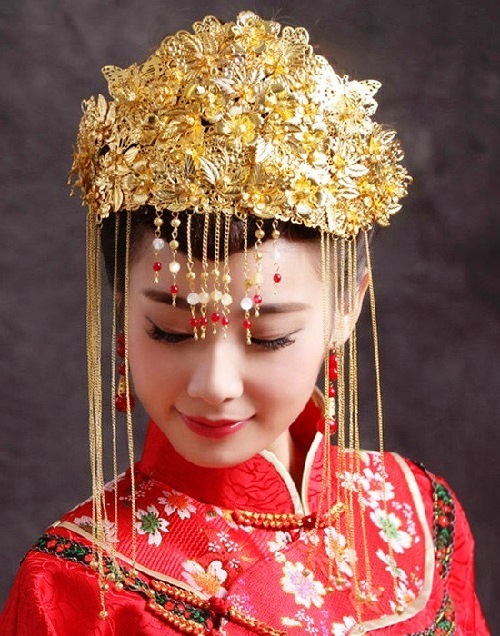 Turning to the present, we can say that life in China runs fast, and no time to adorn hair, and traditional hairstyles are used only during the holidays, ceremonies, as well as in clothes of fashionistas and design collections. Actually, no one wears folk dresses. 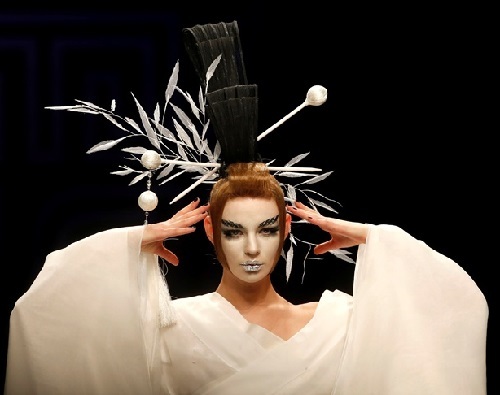 A selection of photos from the Chinese “Fashion Week”. It is quite clear that the unusual haircuts now – the more artistic grotesque than routine. 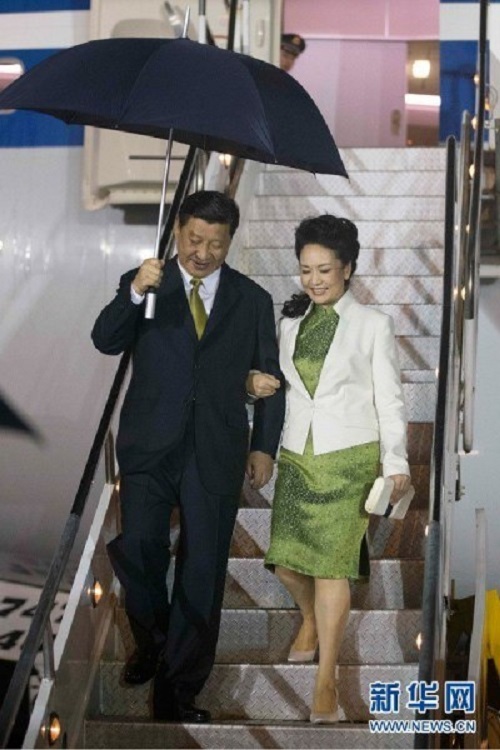 Here are some examples of hairstyles of the First Lady of China – Peng Liyuan. 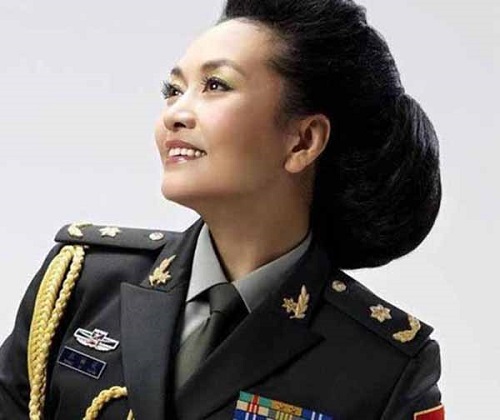 Her hairstyles are also complicated, however, quite restrained, except for artistic costumes, as she is a contemporary folk singer and performing artist.